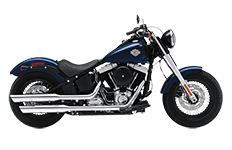 No frills and nothing unnecessary, the Harley Davidson Softail Slim is one beautiful ride. It gets the job done and reminds riders of a yesterday's riding excitement, so finding the right pair of saddlebags shouldn't be too difficult. Fortunately, riders have plenty of stylistic options in the Viking Bag collection of Softail Slim saddlebags. From small to large and everything in between, riders can find that perfect pair for the daily commute or the long-distance vacations. Step inside each of the model pages to learn more about each one. If you still have questions, feel free to contact us at any time.